We were 5 handed, I sat in the little blind, MH62 in the big. Texas Crint was Under the Gun, Julio P was next, and el Pinata had the button and the deck. This is undoubtedly a good flop for me, I've made the 2nd nut straight, and have redraws to the nut low, and a heart flush. Since I'm acting first this round, I decide to bet pot, 8 dollars after the pre-flop action, and much to my surprise MH62 raises pot, making it another $24 to see the turn. Texas Crint and el Pinata fold moving the action back to me. A more experienced player probably re-raises here, the 2nd nuts, redraw to the wheel for the nut low, and the flush redraw which might be good, or at least block the better flush MH62 could be drawing for might make it elementary ... but I agonize about it. 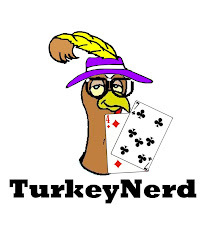 Maybe at another game I can discount 4 7 with a pre-flop raise, but look at the logo of this blog. I'm also without an Ace for the nut low, and MH62 re-raised ME ! EMG's mentioned in other posts that I'm pretty tight, so I'm sure he's strong here, maybe stronger than I want him to be. Ah Ac 4h 7s ? 44 77 ? Both hands run through my mind, but I finally decide to call. Not a strong move, and I hated myself for it at the time, but I know that MH62 isn't afraid to draw, and I want some more information before I commit the rest of my chips. I'm just not able to narrow his hand range down enough for the re-raise, and want to keep some of my stack around for later hands. The River was the Ace of Diamonds. The river not pairing the board gives me the 6 high straight, and Ace to 5 low, allowing me to scoop the 194 dollar pot. If you're up for it, dissect the hand. I believe any errors in the hand were mine, most notably the lack of re-raise after the flop and I'm interested in hearing what the players think. I had to raise pre-flop and the flop thinking only two hands beat me and sure enough, Big John had the cooler. Yes you should have raised on the flop, but in the end you made more money by not doing it because I also had a draw to the second low. The flat call on the flop left me a bit perplexed but in the end, I knew it was getting in regardless of what the turn was at that point. I really wish I had meant to perplex you there, but my head was swimming. I'm glad we mix this game in, but I don't think it'll ever by my go to. Elliot... I'm pretty sure I had the 4 of clubs in this hand. Elliot? I didn't write this. I wasn't even there!